As part of Sports Week, we have been thinking about eating a healthy balanced diet and not eating too many sugars. Some of us thought that this could be tricky because we have a sweet tooth so we decided that we could eat natural sugars like those found in fruits. 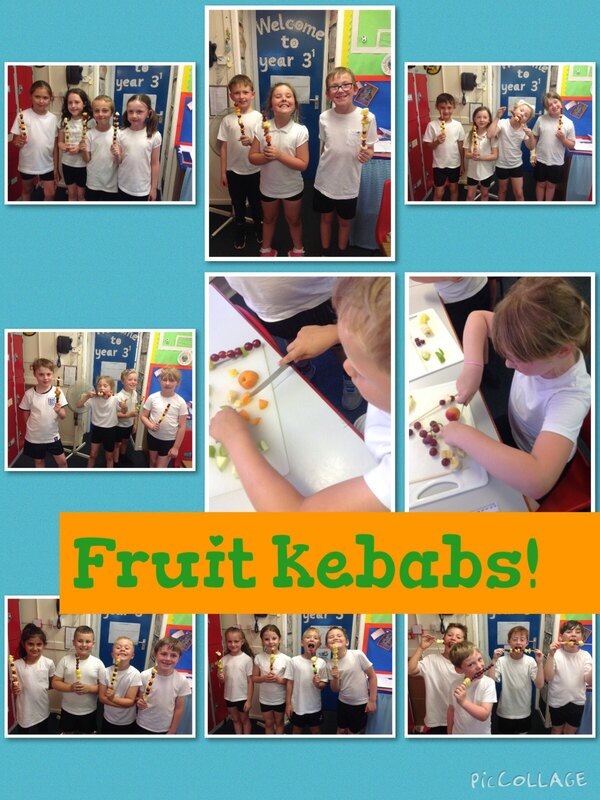 We used our bridge technique to cut pieces of fruit and make our own fruit kebabs which were eaten in seconds! This entry was posted in Year 3 and tagged P.E., Science, Technology on June 28, 2018 by Sandford Hill. The fruit kebabs look really tasty. Mind you, they do have pineapple in them, which is my favourite fruit! I really enjoyed making the fruit kebabs!!! My favourite fruit on the kebab was the grapes. Well done again Year 3, you all demonstrated how sensible you all are using kitchen equipment to carefully prepare and cut your fruit to make your delicious fruit kebabs. I was disappointed though, no one made one for me! I really enjoyed makeing fruit kebabs today my favourite thing was chopping the fruit . I wish I could tast one.